After years of planning, a water pump was installed in our new addition during November. 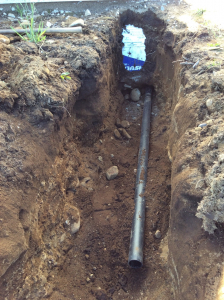 This marks a huge improvement in our year-round Water System. In Summer, water requires much less forethought and labor to access. We have a small, energy efficient, pump that draws water from our creek for drinking, wash water and into the hoses and sprinklers that irrigate our 6,000 square foot garden. A camp hot water heater provides incredible outdoor showers, or choose to embrace the wild and bathe in the creek. Summer is a time of ease of access to that stuff of life. Winter is another story. Though freeze up makes travel easier, access to water becomes a huge chore. For 4 years now we have been chipping holes in the creek ice, dipping in 5 gallon buckets, and bringing them back by sled. This is a daily chore, sometimes even twice daily. So, when designing our addition, we planned to put in a water system that could be used year round. 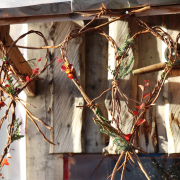 It is simple, efficient, and took a lot of work and forethought to pull off. In my mind, one mark of civilization is easy access to hot water. Creating a system that delivers hot water more or less on demand is not simple or easy in any climate. The extreme cold of interior Alaska makes this all the more complex. 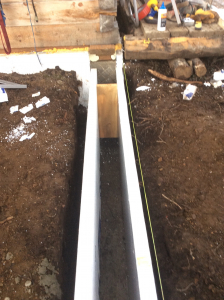 Like most things, having indoor plumbing depends on laying a good foundation. In cold country, a good foundation is an insulated foundation. 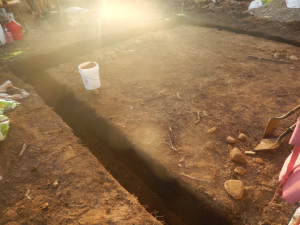 For the addition and future home of the well, we started with a well insulated, sturdy foundation. Forms for concrete were made with high density two-inch foam board. Sand and gravel were laboriously harvested and washed free of silt. Portland cement was flown in by bush plane over the course of two years. Once finally acquired and prepared, the cement, sand, and gravel were mixed by hand and poured into the forms of high density foam. It was quite a project! Most of the 2017 construction season was dedicated solely to the foundation project. There’s no sense in plumbing if it can’t be kept from freezing. 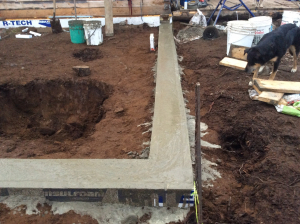 With the foundation laid, we began work on the addition. Once made livable and insulated during the summer of 2018, I cut the handle of a pick mattock down short and grabbed a shovel head without a handle. These tools were necessary to dig a narrow well shaft. We hoped that a sand point could be driven, but the rocky alluvial deposits under loamy topsoil required digging. 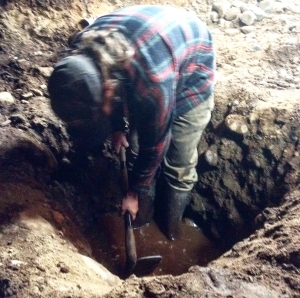 The well we intended to install within the house would have to be dug the old fashioned way: by hand. After I dug about six feet below grade, water began to seep into the hole. At 7 feet, I was standing in a foot of water and could dig no further without first pumping the water out. I was giddy that the “well in the cellar idea” might actually pan out. (Fun Fact: the first steam engines were developed to pump water out of holes). I fired up our little modern gasoline powered pump and kept on digging. The deeper I went the faster water flowed into the well shaft. Eventually, the pump could barely keep up. It was moving 50+ gallons a minute out of the shaft. I was standing in a subterranean creek about 9 feet below grade. After climbing out of the hole and shutting the pump off, four feet of crystal clear water quickly rose into the well shaft. What a milestone. Once all the pieces and fittings were gathered and the kitchen layout finalized, I cut a hole in the floor and installed our fist phase of indoor plumbing: a simple pitcher pump attached to 12 feet of 1.25” galvanized steel pipe. 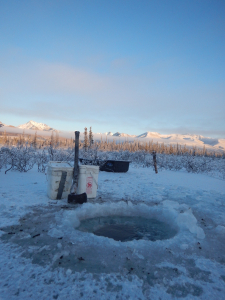 No more will we hack through the ice, kneel down and dip buckets into the creek in -40 degree temperatures. With a few minutes of pumping we now have more water than half an hour of back breaking hauling and chopping could provide. The pump empties into a 10-gallon water jacket on the wood cook stove, providing a ready supply of hot water for washing, cleaning and soaking horse feed. All that water we now pump out of the ground has to go somewhere. Carryingwater outside and tossing it in the yard creates a mini grey water glacier in the yard come spring. So, in the last few diggable days of the fall of 2018 we dug an 80-foot drain line out from the house. It was insulated with whatever we had: foam wrap, feed sacks, leftover foam board, plastic sheeting, worn out tarps, moss and sawdust. Once the sink is installed the drain line will actually see some use. Before that can happen, a cabinet and counter must be made. The water system develops one slow step at a time. 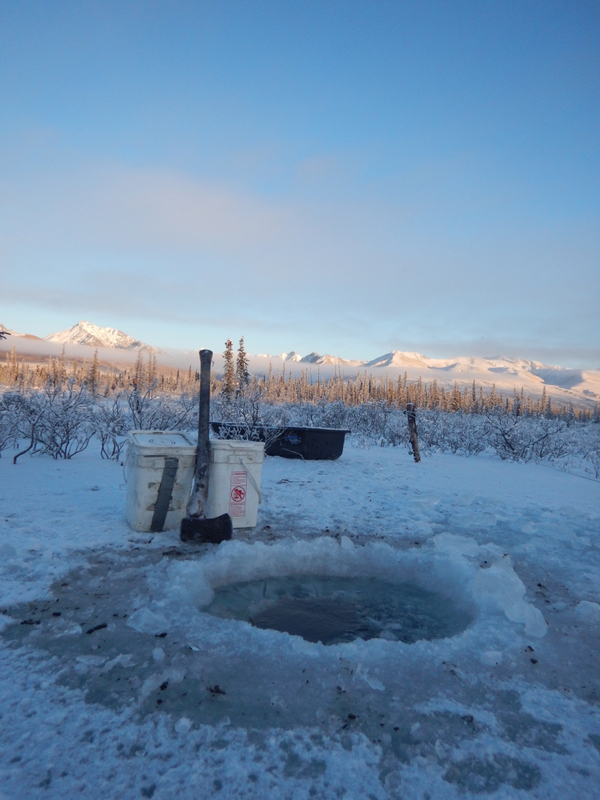 The hard work that we put in has created a water system that drastically outpaces hauling buckets in a sled. Once the power system is upgraded to its second phase (another story), we will install an electric well pump and pressure tank. With truly modern water pressure we hope to pressurize a hot water tank heated by water coils running through the wood stove. Then, endless hot running water will be at our fingertips. 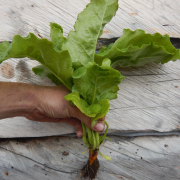 For now, we are excited about the simple improvement of a pitcher pump…. and we still get a work-out! https://apricityalaska.com/wp-content/uploads/2018/12/DSCN2369-1.jpg 2048 1536 Margaret Stern https://apricityalaska.com/wp-content/uploads/2018/04/apricity-logo-small-300x90.png Margaret Stern2018-12-31 08:31:582019-03-09 18:13:37November News: Water Works! Thank you! It is a pretty nice development. Great work guys. Truly amazing and so happy for you. This is an engineering masterpiece. Taking into consideration, that it is being paired with an “off the grid” homestead, I find this comparable to the advantages of using a chainsaw to cut wood in lieu of an axe. Well done. I look forward to seeing the completion of this project and hearing the results of the gray water discharge line battling the freezing ground. Well-Fed: Food on the Homestead Solitude.